The purpose of this section is to review byzantine technique and the materials that we utilize so that you can make an educated decision on the correct technique choice for your installation. When the small pieces are irregularly shaped and handcut, the mosaic mural, or artwork, is considered to be a 'byzantine' technique. The mosaic pieces are typically squares, rectangles and triangles. Each piece fits adjacent to its neighbor. The mosaics follow the artwork lines. Art mosaics created in handcut byzantine are accomplished using two methods. The first method is to print or draw the artwork onto a cloth or background paper. The material is handcut and the different colored mosaics are placed onto the art to create the pattern or design. A paper is glued onto the surface. After the glue dries, the pattern or mural is cut into sections, flipped over and the cloth or paper is removed. Mesh is then glued to the reverse side of the mosaic. The second method is the 'reverse method. The art is drawn or printed onto paper in reverse, the mural or pattern is created by gluing down the material. The reverse side of the pattern or mural is up. This is the side that is set into the mortar or thinset. The paper is then removed after installation. Byzantine murals or patterns are created in two groups: Standard and Micro Mosaic. Standard handcut byzantine mosaic pieces are approximately 5/8 inch to 3/8 inch. Micro Mosaic pieces are approximately 1/2 inch to 1/8 inch. GLASS Byzantine Mosaic murals are made of two types of glass: Smalto, which is handpoured and handcut or Manufactured glass tiles, which are of uniform shape and size. The color palette for manufactured glass is wide but not as extensive as the color choices of handmade smalti glass. Manufactured glass mosaic thickness is fairly consistant as the glass is machine made. Smalto thickness varies per individual mosaic piece. Both types of glass may be cut into irregular shapes for byzantine mosaic. Both types are used to create Standard and Micro Mosaics. Smalto always has a gloss finish and is smooth on both sides. Manufactured glass mosaics have a gloss finish. However, modern glass manufacturing has resulted in a variety of alternate finishes, such as matte, metallic and iridescent. Manufactured glass may be imprinted, which yields a variety of textures such as ripples and undulations on the top surface. However, most manufactured glass mosaics are very smooth. An imprint of grooves is made on the manufactured glass mosaic reverse side to help with adhesion during installation. Our patterns and murals in both smalto and manufactured glass are paper face taped, which is the most common mounting method. This means that the picture of the finished mural is actually in reverse. During installation, the glass mural is installed with the paper side up. The paper is then removed with water after the mortar or thinset cures. Glass is a lifetime material. STONE Byzantine Mosaic murals are made of stone such as granite, marble and/or onyx. The mosaic is machine cut into slabs and then handcut into byzantine mosaics. The thickness for stone mosaic is either 5/8 or 3/8 inch. Stone byzantine mosaics are mesh mounted or paper face taped. Both Standard and Mirco Mosaics are available. Stone is a natural material that is mined. The color palette is limited. Finished stone mosaic murals are typically polished to protect the stone from inclemental weather, wear and tear. However, tumbled-look unpolished mosaics are available. Stone is a lifetime material. Should the polish wear off, it may be repolished. GEMSTONE Byzantine Mosaic murals are made of semi precious gemstones with the option of including other stones, such as onyx. The gemstone is machine cut into slabs and then handcut into byzantine mosaics. The thickness of a gemstone mosaic is typically 3/8 inch. Gemstone byzantine mosaics are usually mesh mounted. Both Standard and Mirco Mosaics are available. Gemstone is a natural material that is mined. The color palette is wide. Finished gemstone mosaic murals are polished to protect the gemstone from inclemental weather, wear and tear. Gemstone is a lifetime material. Should the polish wear off, it may be repolished. CERAMIC Byzantine Mosaic murals: We do not offer this type of mural. 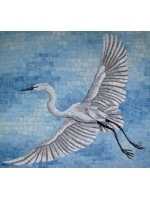 We do offer kiln fired photographic tile, image sublimated tile, handpainted tile and Intarsia tile. Please see our other technique sections. SEASHELL Byzantine Mosaic murals: We do not offer this type of mural. Please see the 'Intarsia' technique for information.